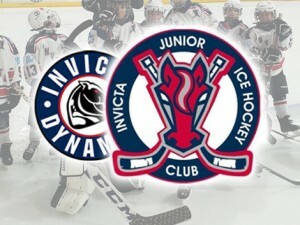 To establish greater links between junior and senior ice hockey in Gillingham the Invicta Dynamos are pleased to be offering free entry to all 2018/19 home games to players of the Invicta Juniors when accompanied by a paying adult (maximum 2 per adult). The Invicta Juniors have teams for skaters ranging from under 9 all the way up to under 18s with the aim to ensure the long term future of ice hockey in Gillingham and promote respect, teamwork, discipline and hard work in all its players. There are numerous benefits for children who play hockey including improvements in fitness, strength, coordination and agility as well as development in confidence, sportsmanship and self esteem. An additional benefit for the 2018/19 season is free entry to all Invicta Dynamos home games at Planet Ice, Gillingham. Players of junior sides will be granted entry into fixtures by declaring their name and team at reception. Junior players must be accompanied by a full paying adult with a maximum of two free entrants per accompanying adult. To mark the new arrangement, representatives of the under 9 Buckaroos and under 11 Invicta Stampede will be holding a short scrimmage between the first and second period at Sunday’s home tie with the London Raiders. Come and support the Mos and catch a glimpse of some of the Dynamos of the future by joining us at Planet Ice, Gillingham on 2nd December. Doors open at 4.30pm with faceoff at 5.15pm. Click here for full ticket details. Sunday also sees the club hold a Teddy Toss in aid of Demelza Hospice Care for Children with supporters invited to throw clean and bagged plush toys to the ice on the buzzer at the close of the first period. All toys will then be donated to Demelza to be gifted to children or sold to help the organisation continue it’s great work. Click here for full details. If you’re thinking of introducing your son or daughter to junior ice hockey then 2019 is the perfect time to start and the under 9 Invicta Buckaroos are recruiting! For more information on how to sign up or the junior setup as a whole please visit: IJIHC.co.uk.